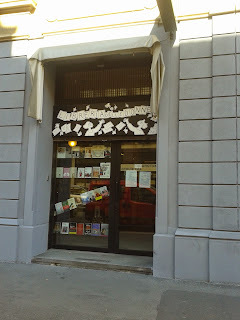 The entrance at the Libreria delle Donne. Wednesday 22 April 2015, at the Libreria delle Donne di Milano [the Women's Bookshop in Milan], there has been the event "Danza e poesia" [Dance and poetry] dedicated to the study I conducted on Martha Graham's Letter to the World, a choreographic work dedicated to Emily Dickinson. The Libreria delle Donne is a historic place and since 1975 it has been a reference point for the debates on the condition and history of women. It was a real honour for me to speak of Graham there. The Libreria has a wide space dedicated to books, a wonderful kitchen where sophisticated meals are cooked and another wide space for events and meetings. Pat Carra has opened the event, introducing Alessandro Pontremoli who has engaged a dialogue with myself. Carra is one of the most famous cartoonists in Italy for her unmistakable stroke and her subtle and perspicacious humour: She is also part of Aspirina's editorial staff, the satirical online magazine of the Libreria with which I have been collaborating for about a year with my strip on la studiosa precaria, the precarious scholar. I have particularly appreciated Pat's words as she talked about the circumstances that brought us together as well as the precarity od research today. Pontremoli is professor of the Dance and Mime History course at the University of Turin, refined expert in Renaissance Dance and not only that. He is also the author of numerous publications, such as La danza. Storia, teoria, estetica nel Novecento [Dance. History, Theory, Aesthetics of the Twentieth-Century]. With Alessandro, whom I have known for nearly a decade, we have talked about Graham, Letter to the World, dance, the complexity of the reconstructing process and, thanks to the questions of the people who came (formidable people! 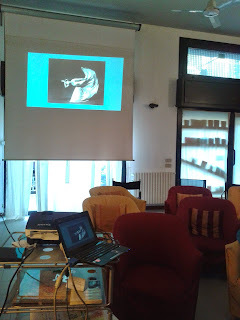 ), we also talked about Isadora Duncan and the little known and still too little explored Italian modern dance. Ane we also discussed about Graham's unusual portrait of the Virgin Mary in primitive Mysteries and showed some videos, such as the iconic Lamentation and some extracts from Letter to the World. It has been a really beautiful event, very rich in stimuli and reflections. I thank again the Libreria and Pat Carra for having organised it and all the people who were there for having turned it into a special moment.